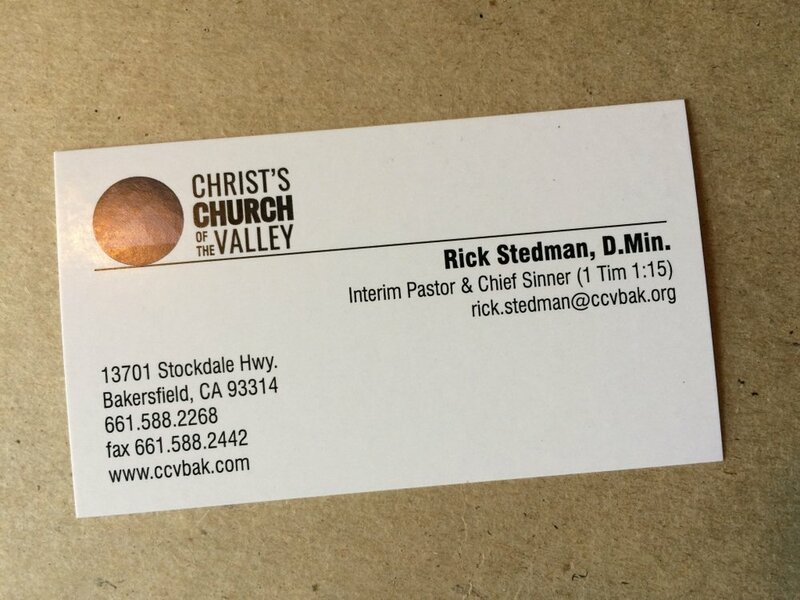 Dr. Rick Stedman, Interim Pastor and Chief Sinner (1 Tim. 1:15). In over 30 years of pastoral ministry, I’ve worn a lot of hats and have been described by various titles, but this was a new one. I’ve been a founding pastor, a senior pastor, a servant-leader, board chair, and, well, the list goes on and on. In my last church, one family tried to keep up with my various church titles as they evolved over the years. When our church was young, their children called me Pastor Mr. Stedman. Then our church grew and I became Senior Pastor Mr. Stedman. Then Servant-leader Senior Pastor Mr. Stedman. Finally, the kids addressed me as (I kid you not) Dr. Servant-leader Senior Pastor Mr. Stedman. I’ve also been called Reverend, Minister, and Preacher, though I’ve never liked these labels and none ever was my actual title. Preacher sounds too preachy and Minister is how we all are supposed to function. But of all the titles I’ve been called, Reverend is the one I like least. This is because, in my opinion, Reverend conveys the idea that I am holier, more righteous, or worthy of greater respect than Christians who are not clergy. Truthfully, I often have found the opposite to be true. I am astounded by the humble, sacrificial, Christ-like attitudes of many church folks with whom I have been able to serve over the years. I have been privileged to know true prayer warriors, lay Bible scholars, fantastic Christian parents, devoted Christian singles, and loving servant-hearted volunteers. They truly amaze me. On the other hand, the longer I have followed Christ, the more I realize how non-Christ-like I am. At times my heart has been full of anger and bitterness, my devotional life weak, and my service more job-related than sacrificial. If people knew what thoughts sometimes enter my head, they certainly wouldn’t call me Reverend. Fortunately, I’m not the only Christian leader who feels this way. I take comfort that the Apostle Paul expressed a similar self-understanding. We can see this in the titles or self-descriptors he gave himself over the many years of his ministry. In the early years, he called himself “The least of the apostles” (1 Cor. 15:9). In the middle of his ministry, he saw himself as “The least of the saints” (Eph 3:8). And at the end of his life, he said he was “The chief of sinners” (1 Tim. 1:15). Do you see the downward trajectory of his own sense of superiority, and maybe even of personal righteousness? The longer he served Christ, the more he was aware of his own sinfulness. He even confessed, “nothing good lives in me” (Rom. 7:18). Which is exactly how I feel when people call me Pastor Rick or Dr. Stedman. These titles describe my functions and achievements, but fail to describe my own sense of unworthiness next to our peerless Savior, and my sense of unfitness to lead his precious people. But God called me into this service, so I obey his call. Nonetheless, if I were God, I would have called someone else. This is why, now that I’ve begun a new chapter in my life and my title reads “Interim Pastor,” I decided to add a phrase to describe my awareness of my own lack of superiority in the kingdom of God: “and Chief Sinner (1 Tim. 1:15)”. If people in our church are shocked by this title, I also was shocked by their response. As I mentioned earlier, I’ve been in the professional ministry for over 30 years. But this is the first time anyone has ever asked for multiple copies of my business card to give to others. Personally, I feel comfortable with the job title on my new card. It feels good to be honest about my own shortcomings, it’s a role I can live with, and, thanks to Paul, it’s biblical.